Online web store to reopen. New 2018 Club Kits to go on sale after midnight tonight! You saw them, the new Club kits. You want one. Now you can get your very own! The online web store will reopen 15 minutes after Midnight tonight and remain open for a little more than two weeks. From Saturday, September 22 at 12:15 am until Monday, October 1 at 11:00 pm you will have a chance to visit the web store to shop for Club apparel. A link to the web store is provided below and on the landing page of the WCBC website (one of the blue boxes below the animated scroll). The links will only be active during the times noted above. 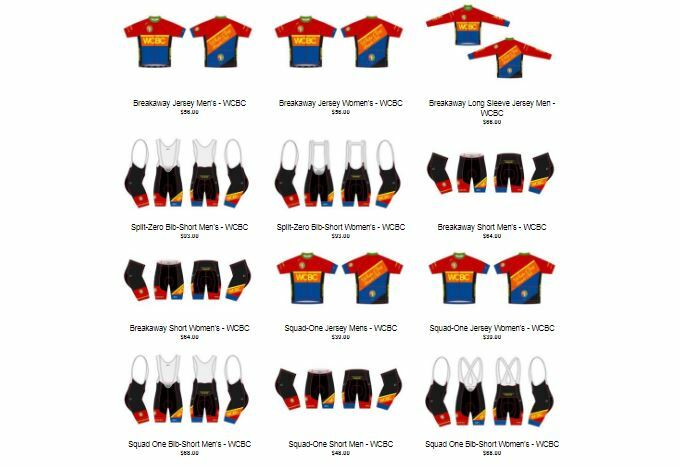 We are offering jerseys, shorts, bib-shorts, and accessories in a colorful design using our Club colors. The web store provides a detailed description of each items along with information about fit, fabric, and pricing. There are three levels of apparel being offered, classified as Good to Better to Best – Squad One, Breakaway and Split Zero. Each one has it benefits, so please take a minute to familiarize yourself with each before placing an order based solely on price. See the prior posting (http://whiteclaybicycleclub.org/message-from-the-president-new-club-kits-for-2018/) for more details about the different lines being offered (Squad One, Breakaway and Split Zero). With regard to pricing, due to the size of our club and the anticipated level of orders, Athlos is offering the Club their best discounted prices on all of the gear. Take advantage of WCBC custom high quality apparel and accessories in Women’s and Men’s specific cut and sizing at a price that you can’t beat anywhere else. On the web store we are also offering cooler weather gear such as long sleeved jerseys, vests, shells, and arm/knee/leg warmers. With summer fading you may want to consider purchasing them at this time so you have them as the temperatures continue to drop. ← Trailfest 2018 – Come See What It’s All About!